Rob Cooper, of Commercial Motors Watford, gets to grips with a range of tools from Chicago Pneumatic, all designed to make the tightening and loosening of bolts easier. While it is common knowledge that loose wheel nuts are clearly a danger to vehicles, their occupants and other road users, over tightening is also a major problem in the industry. Technicians are finding overtightened bolts a constant source of pain when vehicles come into the workshop – the result being stretched studs, which will eventually need replacing. Fortunately, Chicago Pneumatic has released its 1” Torque Limited Impact Wrench (CP7782TL-6), which is designed to tighten up to 500Nm. Rob says: “This is ideal, as it virtually eliminates the possibility of overtightening with an impact wrench. 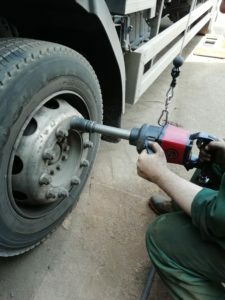 Most heavy-duty vehicles will need wheel nuts tightened to around 600Nm, so this, combined with a precise torque wrench, prevents potential problems from occurring. During the product test, the tool was used to run down the wheel nuts to 500Nm on a Volvo FL truck, with a CP8925 Torque Wrench being used to apply the final required torque. 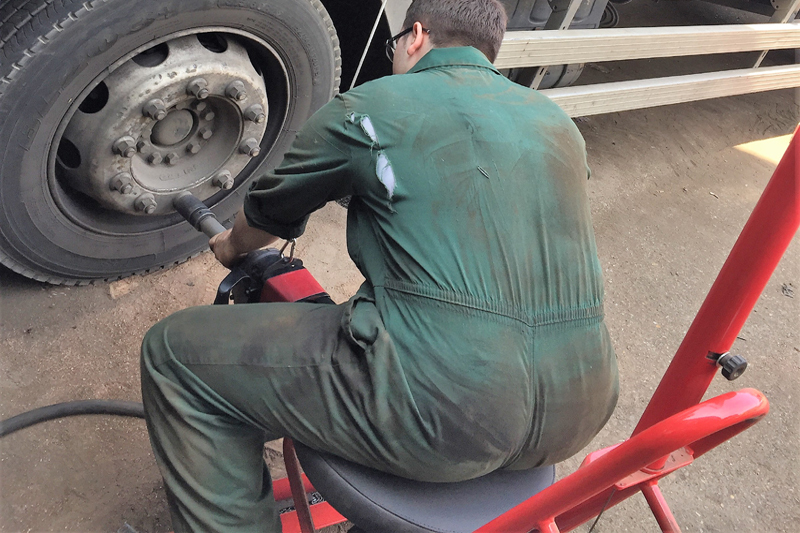 Alongside general repairs and maintenance, the team at Commercial Motors also felt that the wrenches, working in conjunction with each other, would be ideal for mobile tyre technicians when called out to the roadside to replace damaged tyres. To provide additional ease, Rob attached the impact wrench to the CP87029 Chicago Pneumatic ergoseat, which proved very useful in supporting the tool. The seat features a tool balancer, designed to take the strain out of tyre changing and general vehicle applications during maintenance work. The seat is also equipped with its own Industrial Duty Filter/Regulator/Lubricator, ensuring that any tools used with it receive the correct air operating pressure. “When used together, the Torque Limited Impact Wrench and Ergoseat make the tightening and loosening of wheel nuts a much more efficient process. Ultimately, it’s also a health and safety issue. If technicians can take off a bolt faster with less impact and vibration going through them, this prevents strain, whilst the ergoseat negates potential back problems,” concludes Rob.